Bring 4 quarts of water to boiling in a large pot. Fill another large bowl with ice water. Mix dressing ingredients in a shaker jar, or a small container with a tight fit lid. Shake well to combine. Cut off the woody ends of the asparagus. Then cut each stalk into thirds. 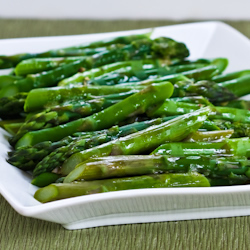 Place asparagus boiling water and cook for 2 minutes. Drain and immerse in ice water for 2 minutes. Drain again. Give the dressing one more good shake, and pour over asparagus. Stir or toss. Chill until you are ready to serve. Can be chilled up to 36 hours.